The many endorsements below are included to show that it is not just the author himself, but many other people also – including Orthodox, Conservative, Reform, and Reconstructionist Jews, as well as Christians, and Muslims – who think their religion has been “stolen” by right-wing politics, but who still believe that compassionate religious values have relevance to current crises. It is hoped that the voices of the people who submitted the statements below, as well as many more voices, will be raised to help revitalize Judaism and other religions and to apply religious values effectively in response to the many threats to humanity today. Richard H. Schwartz, Ph.D. Professor Emeritus, College of Staten Island Author of Judaism and Vegetarianism, Judaism and Global Survival, Mathematics and Global Survival, and Who Stole My Religion? 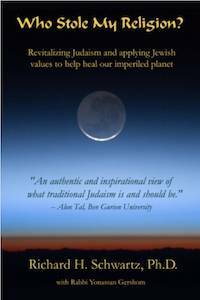 Revitalizing Judaism and Applying Jewish Values to Help Heal Our Imperiled Planet, and 200 articles at JewishVeg.com/schwartz' President Emeritus, Jewish Vegetarians of North America; President, Society Of Ethical and Religious Vegetarians (SERV).